Budapest (VNA) - General Secretary of the Communist Party of Vietnam Central Committee Nguyen Phu Trong and his entourage on September 9 visited Szentendre - an ancient city lying on the bank of Danube River in Pest County, about 20km from Budapest capital city of Hungary. The Vietnamese Party chief is on an official visit to Hungary from September 8-11 at the invitation of Prime Minister Viktor Orban. Szentendre city is known as the land of painters, with many museums and photo galleries. During his stay in the city, Party leader Trong met with Mayor of Szentendre city Verseghi-Nagy Miklos, who gave a warmly welcome to the Vietnamese delegation. Host and guest highlighted the traditional friendship between the two nations, which has been incessantly expanded in recent years. 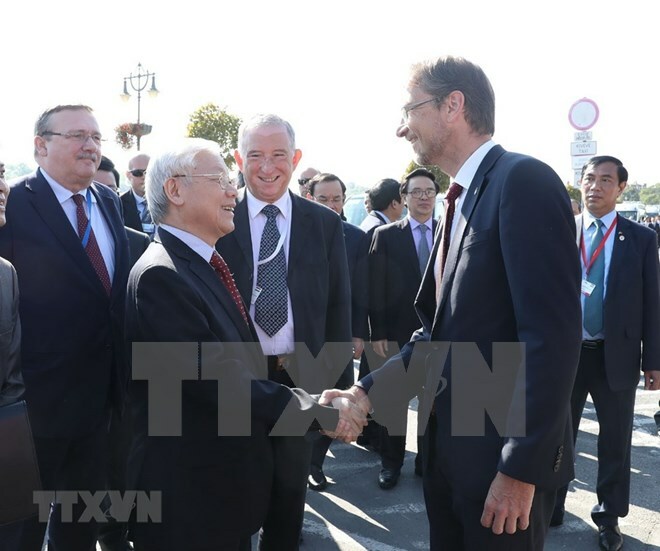 The two sides have exchanged many high-ranking delegations and promoted fruitful cooperation across spheres, especially economy, science, education and training, they said, noting that many Vietnamese officials, doctors and engineers have been trained in Hungary. Szentendre set up relations with Hoi An city of Vietnam’s central province of Quang Nam, the mayor said, expressing his impression on the hospitality of Vietnamese people. He voiced his belief that the visit made by Party leader Trong will contribute to pushing the friendship and cooperation between his country and Vietnam. The Party chief thanked the municipal authorities and people for their warm welcome, expressing his delight to have a chance to visit Szentendre - a culture and art city with long-lasting history, peaceful environment, and charming architectural works. He said that his visit to Hungary aims to bolster all-round cooperation between the two nations, including cultural exchanges and collaboration between their localities. The Vietnam-Hungary traditional friendship, an invaluable asset of the two countries, needs to be preserved and passed to next generations of their people, he underlined. The Party General Secretary stressed that the Southeast Asian nation has been grateful for Hungary’s support during the national protection and construction. Thousands of Vietnamese officials and engineers received training in the central European country, many of them are holding important positions in the State apparatus, he added. He expressed his belief that the bilateral cooperation will further develop in the fields of politics-diplomacy, economy, trade, investment, culture, and tourism. Also, he lauded collaboration between Szentendre city and Hoi An ancient town, hoping that their cooperation will be bolstered in an effective and practical manner in the future.